"This is a Japanese cheesecake which is so light that it seems a little like a souffle. You only need cream cheese, eggs, and white chocolate to make this easy gluten-free dessert! This cheesecake tastes best after it has been chilled for a a few hours in the fridge. It keeps in the fridge for a few days. Serve as is or with a drizzle of pureed berries." Preheat the oven to 350 degrees F (175 degrees C). Line the bottom of a 9-inch springform pan with parchment paper. Place white chocolate in top of a double boiler over simmering water. Stir frequently, scraping down the sides with a rubber spatula to avoid scorching, until chocolate is melted, about 5 minutes. Remove and allow to cool slightly. Mix in cream cheese and egg yolks. Beat egg whites in a large glass, metal, or ceramic bowl with an electric mixer until stiff peaks form. Fold in the cooled white chocolate mixture. Pour into the prepared springform pan. Bake in the preheated oven for 15 minutes. Reduce oven temperature to 300 degrees F (150 degrees C) and bake for an additional 15 minutes. Turn the oven off, leaving cheesecake inside for for a further 15 minutes. 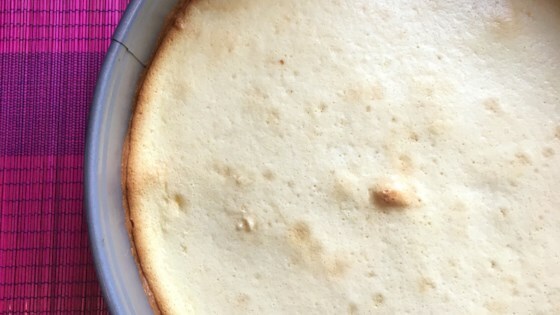 Remove cheesecake from the oven and allow to cool completely at room temperature, about 1 hour. Chill before serving, about 3 hours. I’m not a fan of white chocolate so I substituted regular and it turned out fabulous! I added a hint of lemon to it and it was fantastic!